The Company wants to focus on Financial consolidation, Cash Flow collection and reduction in Expenses in existing businesses. 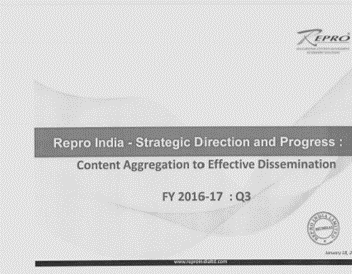 In Q3 the company has a turnaround due to the impact of the strategies mentioned above. The company will continue with current strategies and is expecting much better performance in Q4. The company has signed on more than 70 Publishers in India which are most of the large publishers in India, which will make it easier to sign other medium and smaller publishers. Internationally, Ingram has been providing a steady stream of books from over 20,000 Publishers. The company has doubled number of book titles in last 2 months to 1 million titles. The company prints books after order hence no warehousing and obsolescence cost for publishers as many online orders are on COD, however weekly revenue has increased to Rs 30 lakhs from Rs 20 lakhs. The company has increased channels of sale from just Flipkart and Amazon to others including snapdeal, paytm, infibeam and others in Q3. The company is a Platinum seller on amazon ie its products are listed on amazon prime and people can get delivery within 24 hrs. The company has also started listing titles from indian publishers internationally through ingram. Exports in printing business not as expected in Q3. Main focus of printing business is collection from debtors. Business in Africa still challenging due to foreign exchange issues in Africa, but with increase in oil prices this may improve. 20% increase in billings led to increase in domestic debtors. Working Capital stuck in old debtors is being recovered gradually . Stronger order book for Q4 as compared to Q3. Order book size for Q4 as of January is 57 crore. Increase due to increase in paper prices. Aim for Breakeven in Rapples e-learning business. The company has started pilot testing of rapples with the government of Karnataka and has been getting a positive response. The management is hopeful of future prospects of rapples too. Other Competitors have to maintain inventory. In case of no inventory they generally have a lead time of 3-4 weeks on international titles. Repro does not have to maintain any lnventtory and delivers in 24hrs due to its Print On Demand business model, giving it a Competitive advantage. Competitors include UBS, Prakash, IBD and others. India currently has 9,000 publishers. Internationally ingram provides 45,000 Publishers with 14 million title s.
Current market size is of Rs 1,000 crore online, market size to grow to Rs 8,000 - 10,000 crore in next 4 - 5 years. There are three main categories of titles which includes Best selling titles, Mid selling (titles with average selling volumes and fewer sellers) & Back Selling (slow selling books or books which are out of print). POD (Print on Demand) business model lets the company to sell back and mid selling titles with more selling opportunities and higher margins. Best selling titles involves huge discount to be provided but are still sold for maintaining volumes. POD business to provide better EBITDA than Printing business. However no future commentary on Margins can be shared. Currently producing 800 to 1,000 books a day will provide satisfying EBITDA margin by 6 months if current growth rates are maintained. Only Company in India providing POD model. Challenges include building IT infrastructure. Company is making investment for 2 years now in the same. Other challenges also include providing security of books to publishers not easily replicat ed by others. Current Capacity is of about 6000 books a day. A Capex of 11 to 12 crores will lead to increase of capacity to 20000 books a day. No concrete plans for Capex in FY 1 8-19. Further Capex may include setting up a factory in Delhi.